This beautiful cabin is the perfect place to find peace and tranquility. 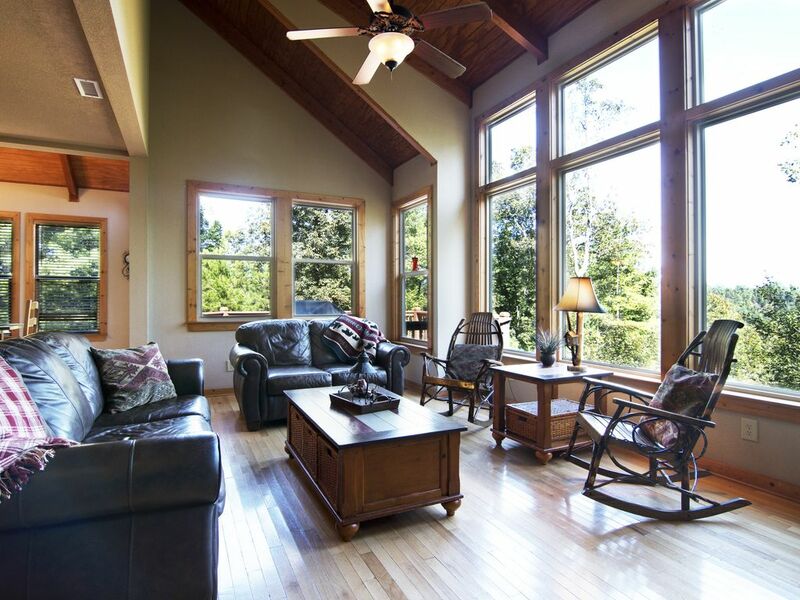 It is spacious and open with mountain views visible from all main living areas. The upstairs master suite is complete with a queen bed and private bathroom with shower, jacuzzi tub and skylights. There are two bedrooms on the main floor, one with queen bed and TV, the other with a trundle bed which could be used as 2 twins or a king bed. There is also additional sleeping on the queen sleeper/sofa. Nature lovers will enjoy relaxation on one of the large back decks where wildlife is abundant. This home is located in Talking Rock Creek Properties with access to all community amenities including a community pool. Talking Rock Creek Properties is a heavily wooded, gated mountain community. Perfect for those who love nature. Spend your day exploring the beautiful Georgia Mountains or relax the day away in this comfortable and cozy home enjoying the hammock, the crackling of a fire in one of the fireplaces, a bar-b-que on the gas grill or a long soak in the jacuzzi tub. All the comforts of home and more with a fully equipped kitchen. My husband and I grew up in the Tampa Bay area but have always chosen the mountains as our vacation destination. We find the mountain scenes breathtaking. We love the mountains so much that we decided to build our own vacation home in 2008. The slow pace and southern hospitality keep us coming back year after year. Talking Rock Creek Properties is the definition of serenity. The 'quiet' is a rare find. The property is completely private, but only 20 minutes from shopping centers,restaurants and grocery stores. We enjoy the creek, naps in the hammocks and the fire pit. You can completely get away from it all and immerse yourself in the beautiful mountain scenes within Talking Rock Creek Properties. Much of our time is spent relaxing on one of the decks, but when we get out we enjoy antique shopping in quaint downtown Talking Rock, Jasper, Ellijay and Blue Ridge. Near by Carters Lake is also a favorite, if you love the outdoors you'll love this area. Hiking opportunities are plentiful. Fish for bass, trout, catfish and brim in Talking Rock Creek. Fish for Bass, Trout, Brim and Catfish in Talking Rock Creek. We stopped for a couple of nights here on the way back from Florida and so pleasantly surprised. The views from the nicely decorated living space were beautiful. It was a great place to rewind after and long week of meetings. The deck was large and overlooking great mountain views. It was peaceful. The furniture was very comfortable and everything was sparkling clean. Great kitchen for cooking and enjoying meals. There is a nice looking grill and large fire pit. We didn’t have a chance to use them, but we are planning on a return trip and for sure will do so. Thank you so much for a great experience! Such a sweet, spacious space with a beautiful view. We enjoyed everything about this cabin, especially for getting away from the hustle of life. It forces you to chill and relax! The property is beautiful in a very tranquil and beautiful spot. The cabin is very well equipped. We had a wonderful stay and explored the area enthusiastically. It was the perfect setting in which to celebrate Christmas. The children enjoyed exploring the woods and finding the creek. Our only problem was that the cabin took nearly 18 hours to reach 68 degrees as it was at 50 degrees when we arrived and it was only just above freezing outside. We had a fairly cold first night. Second stay was just as amazing as the first. Very spacious, clean, comfortable and well stocked. The views from our cabin were beautiful. Very relaxing and peaceful. Owner was very nice. Road is a bit steep and gravel. Quite a ways to stores and restaurants. This is a great area for most outdoor activities including fishing, hiking, zip lines, horse back riding, white water rafting, apple picking (in season), golfing, etc. If you enjoy historic towns, antique shopping and restaurants there are plenty of great choices.